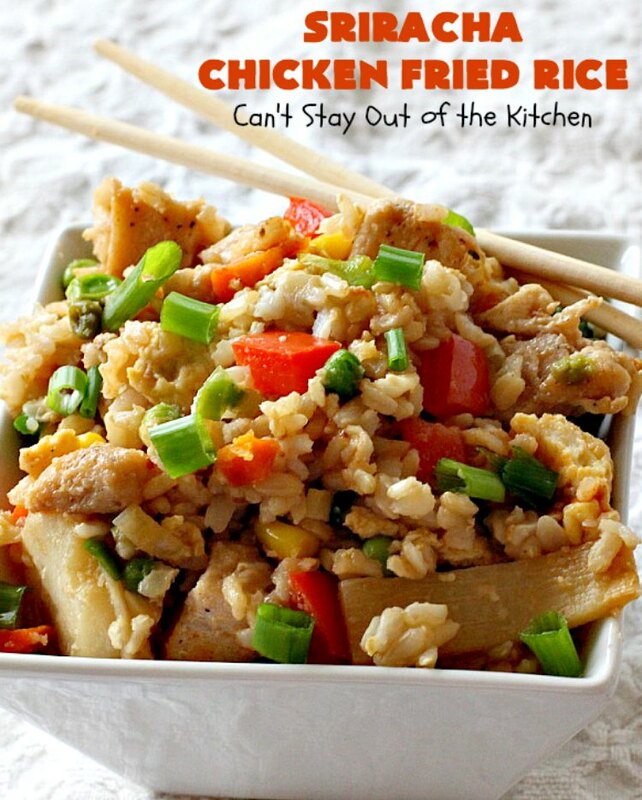 Oh my gosh, Sriracha Chicken Fried Rice is fantastic! I love Fried Rice anyway, but add a dash of Sriracha sauce and it becomes amazing. Seriously. 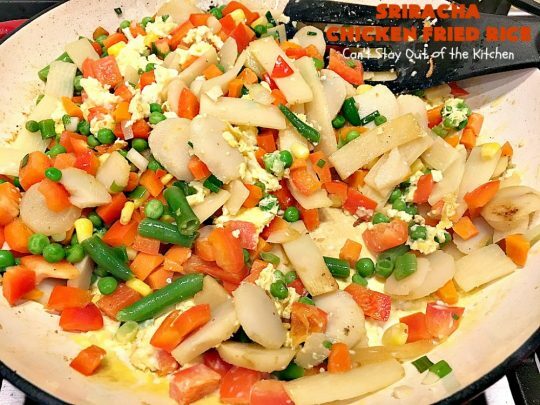 This delicious entree is made with tons of veggies. 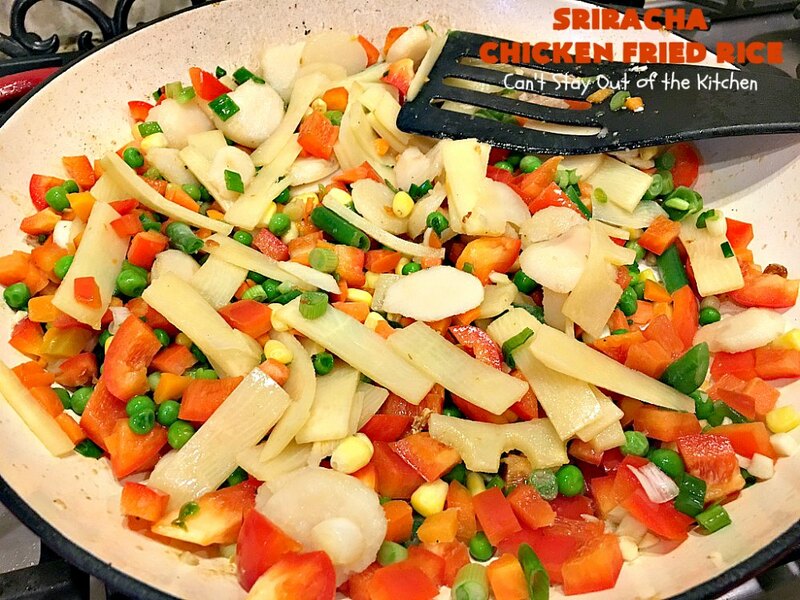 I included frozen mixed vegetables along with bamboo shoots, water chestnuts, bell peppers, onions and garlic. 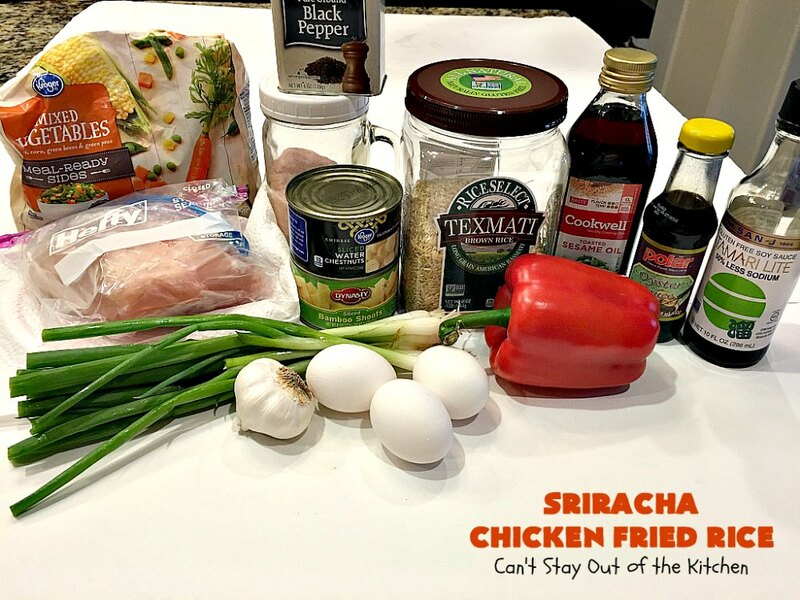 In order to keep the recipe gluten free I chose to use Sriracha sauce instead of the traditional oyster sauce (which also bumps up the flavor). This fried rice was something special. 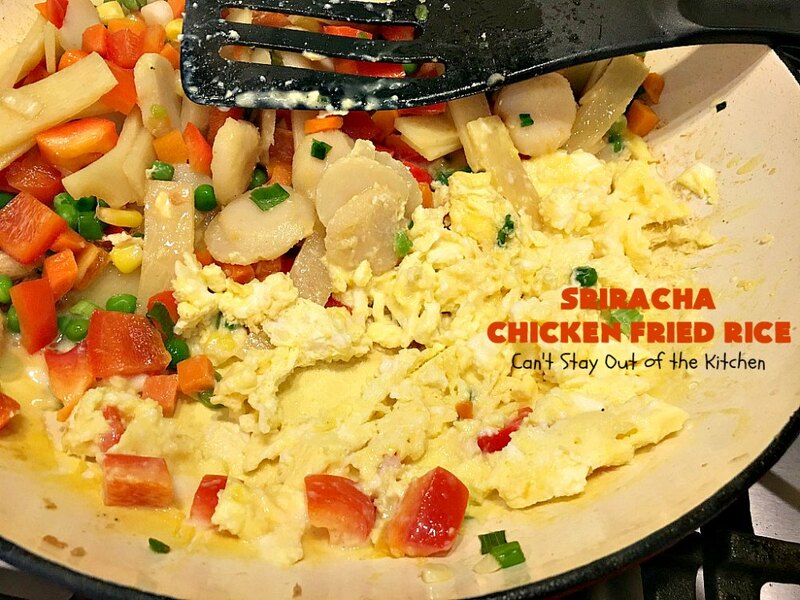 I worried about whether or not the Sriracha sauce would be too strong. For the quantity I made, however, it was perfect. Plus, I liked the fact that this is a 30-minute meal if you have your rice pre-cooked. 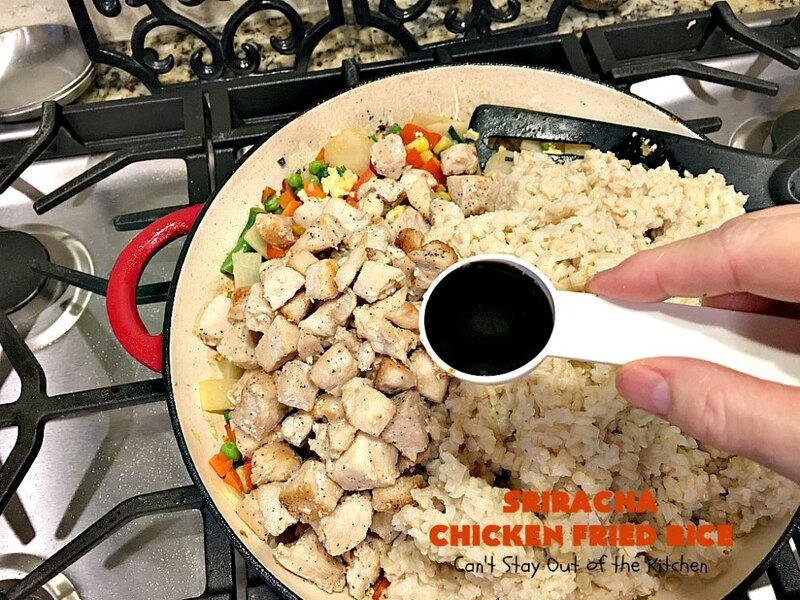 That makes it perfect for weeknight meals. A couple of tips: I make the rice either the night before or early in the morning so it can be cold when adding to the recipe. I use one cup of brown rice for 3 cups of water when cooking. The rice plumps out quite well that way and it’s not tough. Second, when you scramble the eggs, you may need to turn your heat down a little so they cook up nicely and don’t burn. Third, while I chose the veggies listed, you can add more or take away what you don’t want to use. Fourth, cut your meat into small pieces if possible. I would recommend even smaller pieces then what is shown here. 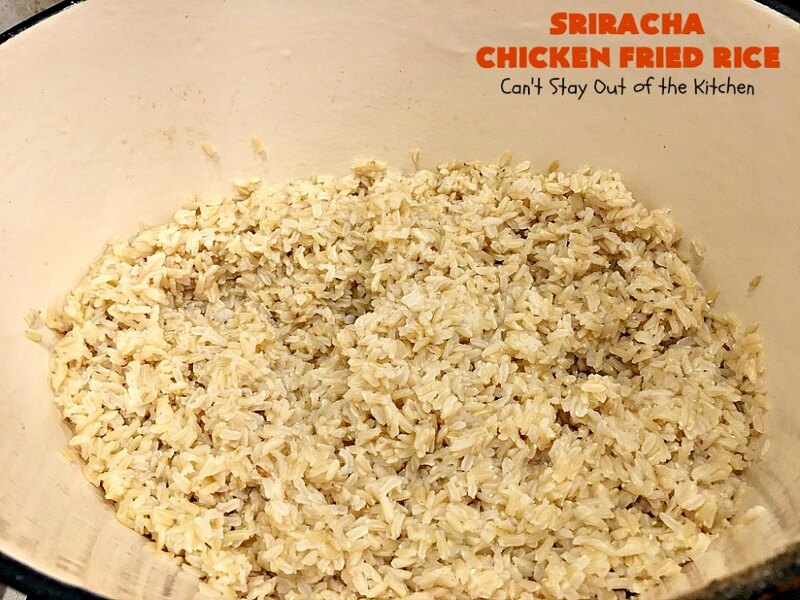 Especially if you want to make large batches for freezer meals (which is what I did). But the cooking time will also decrease if the chicken is reduced in size. Fifth, have all your meat and veggies prepped and ready to go when you begin the recipe. 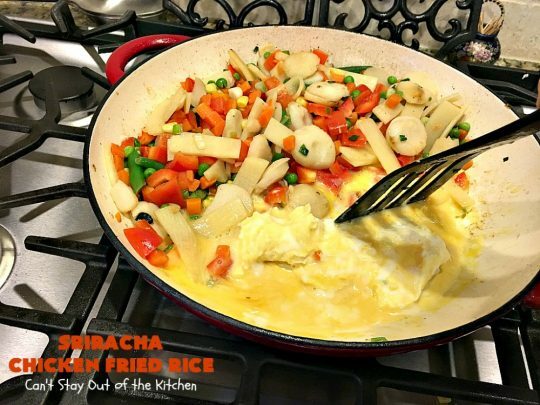 It goes very fast and if you’re still trying to chop up veggies when the other stuff is ready, you may end up with some veggies over-cooked and others just barely cooked. 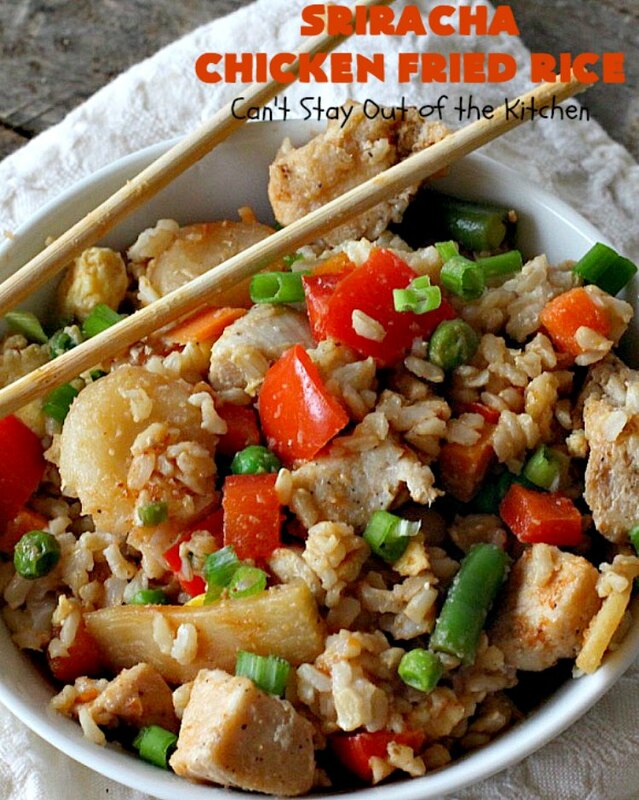 Sixth, use a gluten free low-sodium soy sauce so the soy sauce doesn’t overpower the dish with sodium. 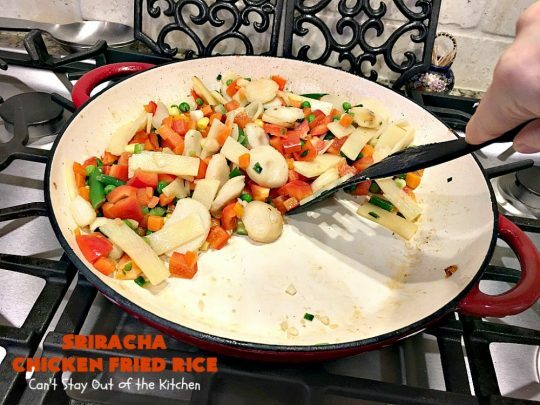 If you’re looking for an outstanding 30-minute weeknight meal that’s healthy and gluten free, I can’t recommend Sriracha Chicken Fried Rice highly enough. Especially if you like a little zip in your meals. This has heat without being overpowering. It’s also got a delightful crunch from the bamboo shoots and water chestnuts. We loved it and believe you will too. 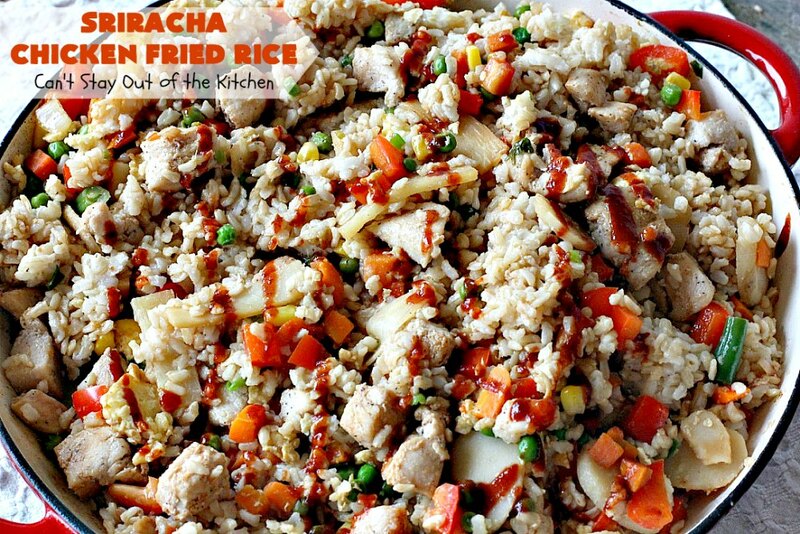 Sriracha Chicken Fried Rice is awesome. 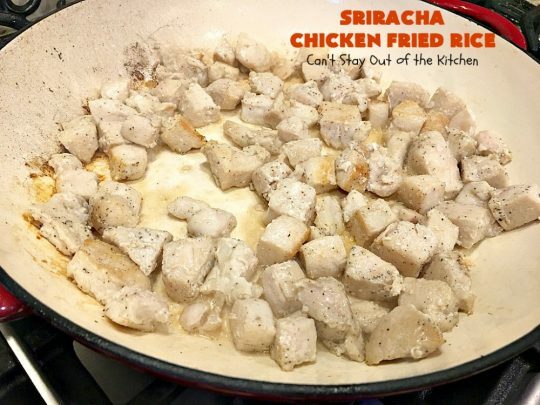 I added Sriracha Sauce in the recipe and squirted it on top for extra flavor. 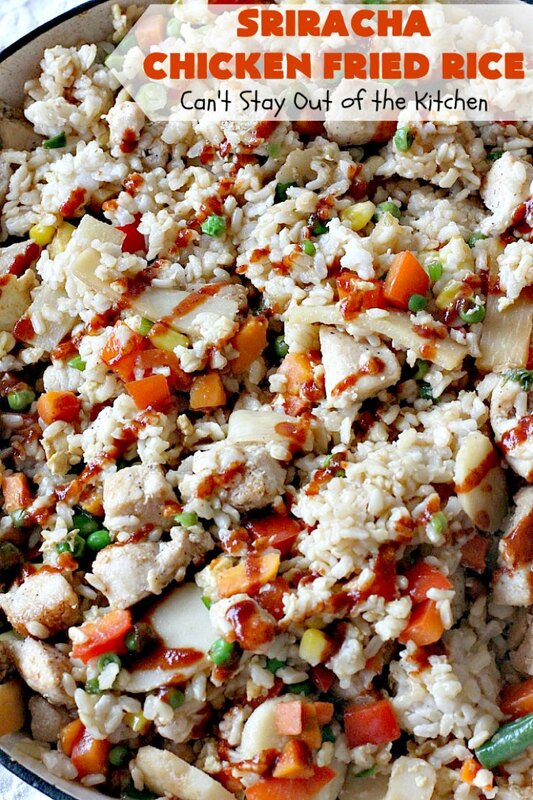 If you pre-make and cool your rice, Sriracha Chicken Fried Rice is a 30-minute meal. I used these ingredients. 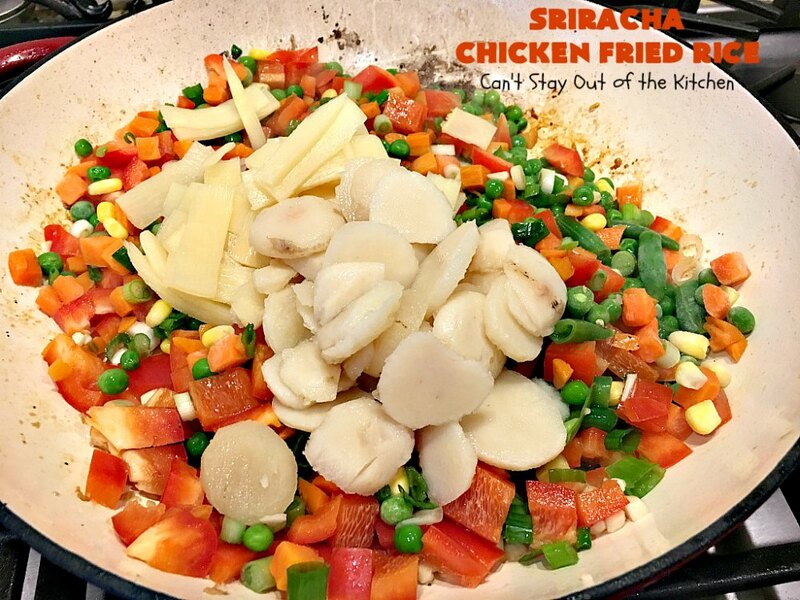 I swapped out the oyster sauce for Sriracha sauce so I could keep the recipe gluten free. 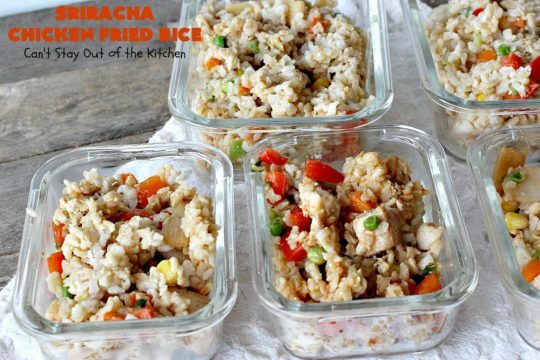 Pre-cook your rice and refrigerate until cold. I used 2 cups of brown rice with 6 cups of water and cooked down slowly. 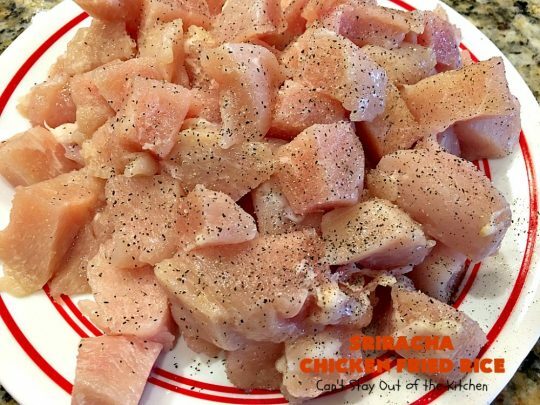 Chop up chicken and season with salt and pepper. I recommend even smaller pieces then these. 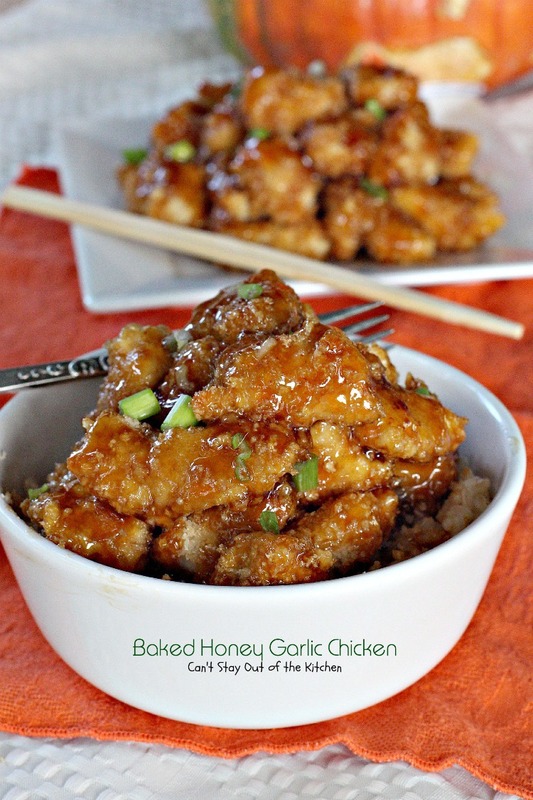 Place two tablespoons sesame oil in skillet and heat over medium heat. Saute chicken and stir fry about 5 minutes until chicken is cooked through and opaque. 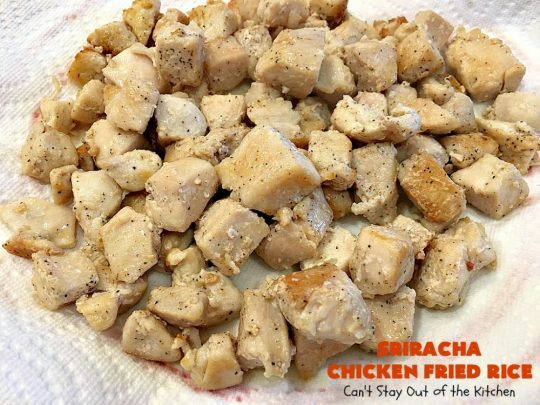 Remove chicken to paper towel-lined plate and set aside. To skillet add additional two tablespoons sesame oil. Add frozen mixed vegetables, green onions, bell pepper and garlic. Stir fry veggies about 3-5 minutes. Stir in drained bamboo shoots and water chestnuts. Heat through about a minute. 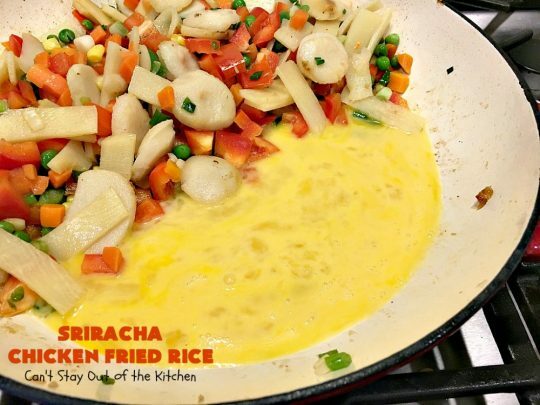 Push veggies to the side of the skillet. You may have to reduce the heat to low-medium. Slowly scramble eggs over low heat. Here the eggs are cooked through. Break scrambled eggs into pieces and stir into remaining mixture. 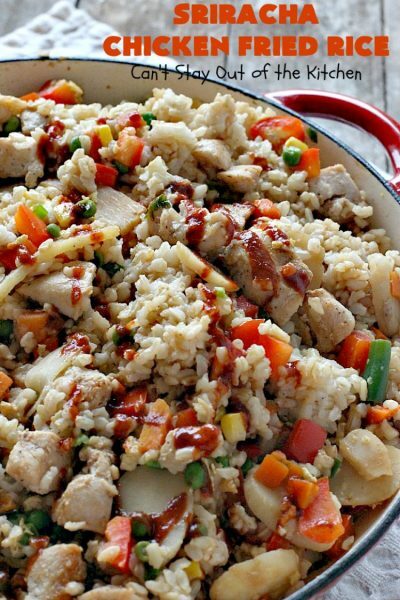 Stir in chicken, cold rice and soy sauce. Add Sriracha sauce. I used two teaspoons here and squirted an additional teaspoon over the top once it was ready to serve. Combine all ingredients. 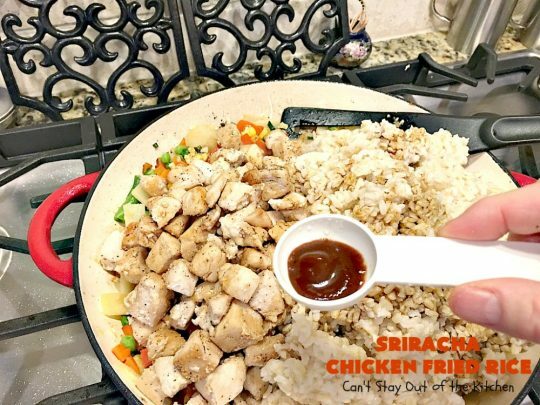 Squirt additional Sriracha sauce over top of the rice dish before serving. I made a large batch so I could have freezer meals. This 30-minute chicken entree is spectacular. If you enjoy fried rice, you’ll love it prepared this way. This amazing 30-minute meal is made special with the addition of Sriracha sauce! 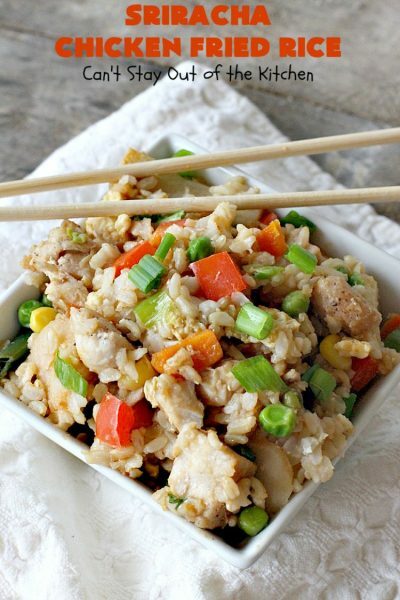 Fried Rice never tasted so wonderful as this terrific recipe! Great for week night dinners when you're short on time. Gluten free. 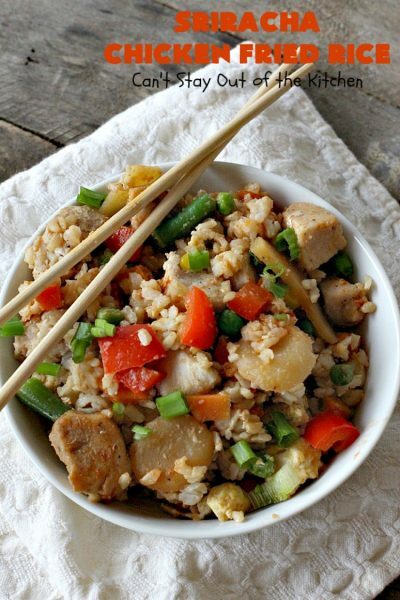 Add chicken and stir-fry, cooking both sides of meat until cooked through—about 5-10 minutes. Remove chicken from heat onto paper towel-lined plate and set aside. Then add frozen mixed vegetables, green onions, bell pepper, water chestnuts, bamboo shoots and garlic. Scramble eggs then break into pieces and stir in to remaining veggie mixture. Add cooked chicken, cooked rice, Tamari soy sauce and Sriracha sauce. 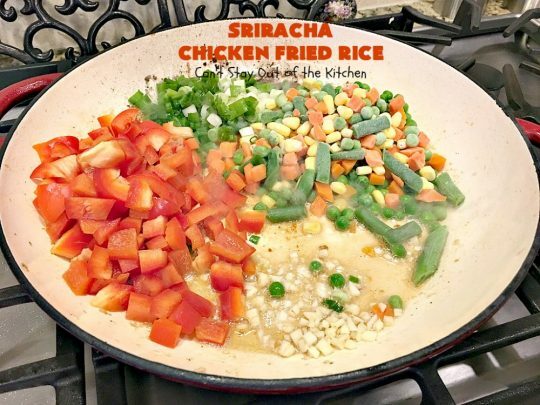 Garnish with green onions, and additional Sriracha sauce, if desired, to serve. NOTE: Oyster sauce uses soy sauce in the ingredients. Most soy sauces are NOT gluten free (except Tamari). If you desire to keep this recipe gluten free, then omit the oyster sauce. I substituted Sriracha sauce instead. NOTE: I used 2 tsp. Sriracha sauce and stirred in with the soy sauce. Then I squirted another teaspoon or so on top of the rice to serve. NOTE: You need either oyster sauce or Sriracha sauce to provide adequate flavor for this recipe. Otherwise, you may find it too bland. NOTE: Preparation time does not include time required to pre-cook and cool rice. Sriracha Chicken Fried Rice is healthy and gluten free! Adding Sriracha sauce really brought out terrific flavors in this dish. 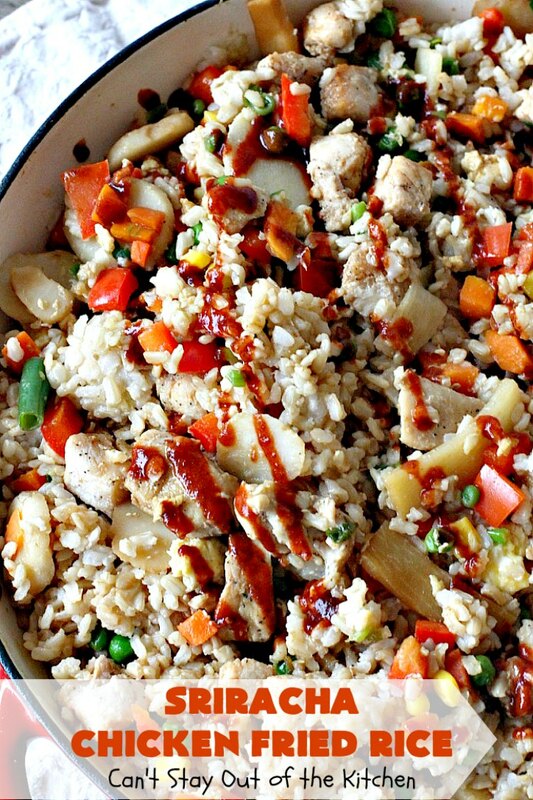 We drooled over Sriracha Chicken Fried Rice and couldn’t get enough of it!